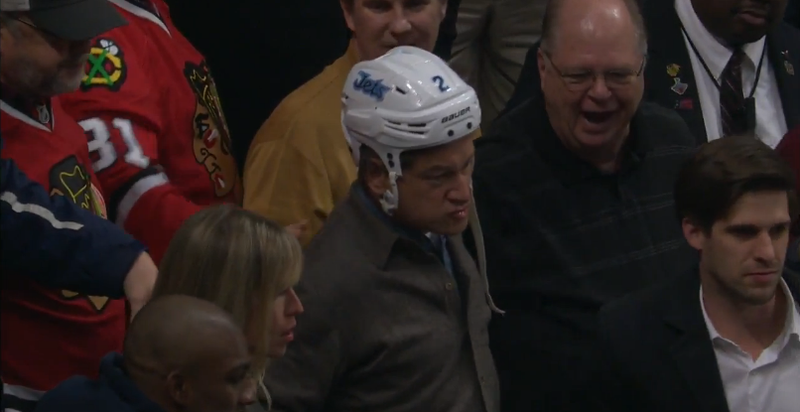 Yeah, the dude snags Pardy’s helmet and dons it. No subtlety necessary. You can tell this guy had a few drinks over the course of the evening. No person in their right mind would really want to touch, or even smell, let alone put on a used helmet that late in a hockey game. Heck, he spilled a beer over Pardy. Did he do it on purpose? Doubtful. That beer cost good money, though I suppose if you are sitting 2 rows from the glass at a Blackhawks game, you can afford to lose a beer for a “good” cause. Adam Pardy was interviewed after the hit, and was a real good sport about it. Though I hope to the hockey gods that he cleaned that helmet off before putting it back on. Yeah, I know this hit isn’t as good as when Boston’s Milan Lucic hit then Toronto Maple Leaf Mike Van Ryn, shattering a pane of glass to smithereens. Those fans got a different kind of souvenir. But it certainly will live on as one of the more interesting stories of broken glass in the NHL.